Lettuce, onions, peas, peppers, potatoes. For those who may have missed previous installments, clicking the keywords at the bottom of the post will take you to all posts on the subject. It's that time of the year, again. If you live in a warm area like I do, air conditioning is pretty much a necessity. It's not so bad during the day, because there are any number of things you can do to beat the heat. The problem is sleeping; it's hard to get a good night's sleep when the house still holds residual heat from the long, hot day, and it's still 80 or 90 degrees outside. Those who live in a house with central air conditioning don't have to worry. 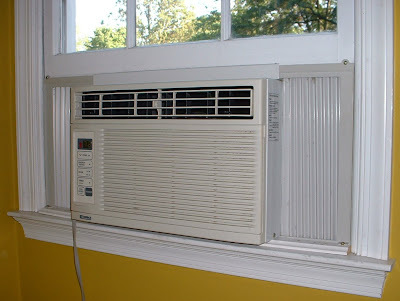 But for those of us who must rely on a small window unit or RV air conditioner, this time of the year is when we face the question of whether it is even gonna start and cool. Those who live offgrid especially, whether fulltiming in an RV or homesteading in a fixed location, are familiar with the question of whether their generator or inverter has enough oomph to start the air conditioner. They get harder to start with age, and generators lose power with age. Adding to the difficulties, the power from small generators is hard on the start capacitor in air conditioners, because the voltage and frequency fluctuate every time the compressor cycles. What happens is the motor windings in the compressor initially draw heavy current, which causes the generator to slow down momentarily as it tries to pick up the increased demand. Then those same windings "kick back" with a voltage spike that can be much higher than the nominal supply voltage. This kick back is damaging to the capacitor (because it is too small to run on a marginal power supply), and also to other appliances on the circuit. Ever notice how the lights dim when you turn on the air conditioner? Well, the dimming is followed by a spike that you may or may not see, but every time it happens, it damages your light bulbs and, more importantly, your electronic appliances. This damage builds up over time, shortening the life of those appliances, and of your light bulbs. There is a device called a hard start capacitor or start booster, that significantly relieves these problems. It is simply an additional, larger capacitor and a relay. The relay is necessary because the large capacitor cannot stay in the circuit all the time; it would be constantly "fighting" the inductance of the running compressor, causing both the capacitor and the windings to overheat and wasting energy. It only needs to be in the circuit when the windings kick back, so as to absorb that voltage spike and feed it back into the windings in the proper phase, when they can use it. The way it works is, most of the time the relay is off, keeping the hard start capacitor out of the circuit. When the compressor tries to start, the relay senses the voltage spike and turns itself on momentarily, just long enough to allow the start capacitor to absorb and then return the surge, giving the compressor the boost it needs to start turning. Then the relay turns back off and waits for the next time the compressor cycles. ...An exact cross between Dennis Weaver and Randy Weaver. This is Phil Garlington. At least that’s how I imagine he must be, after reading “Rancho Costa Nada, ” Garlington’s ingenious treatise on his “independent” lifestyle as a desert-dwelling slacker. This short, easy ­to- read how -to book thoroughly examines the financial, psychological, and material logistics of how even a lazy slackass with a bad attitude, no technological capability, and a disarming lack of handiness, can successfully become a desert homesteader. There are several disadvantages to this life. The Rancho is 53 miles from the nearest traffic signal. It is reached only by traveling more than 17 miles of unpaved road, some of it as rough as washboard, and deep in sand. "It's basically wasteland," Garlington says. "Nothing will grow here." There are snakes, insects, summer heat, and winter winds so fierce they would blow over a boxcar. The advantage is that one can live like a land baron for practically nothing, like a pioneer, like a homesteader out of the Old West. Nobody tells you what to do. Free as a bird; free as Huck Finn, drifting on his raft, except this is desert. All the good rivers have been taken. It starts with cheap land: Garlington paid $325 for his patch of scorched, worthless earth at a tax-default land auction. He paid approximately $300 for building and equipping his desert shoebox, and $179 of that was for a U-haul to drag his stuff to his property. Things really got started because of that last firing. After having been canned from his umpteenth reporter job, Phil Garlington decided to abandon modern society. Not because there was anything particularly wrong with it, but because he had no cash and no income, and he needed a cheap place to crash. Moreover, he was tired of being fired for things like “bad attitude” and “insubordination,” and he was bored eking out a living as a third-rate journalist of the community daily circular variety. The thought of living like a refugee was less horrifying to him than the thought of facing yet another drone-like occupation that served merely to feed his addiction to modernity. So he fled the daily grind into the sunburned arms of his desert homestead. Setting up camp in the burning waste of Smoke Tree, a settlement in Imperial County, California, may seem like a drastic method of gaining this freedom, but it worked for Garlington. He built a shoebox-shaped shack, or hogan, out of sandbags, tarps and “crapboard” (Garlington’s own invention made of scrap plywood he glues into architecturally valid 4-by-8 panels) along with anything he managed to scrounge together and haul into the mighty desert. Garlington even has a second hobo residence. He has a small trailer closer to the town of Blythe, so that when he does need the occasional crap job, he doesn’t have to go the 40-plus miles back to Smoke Tree. He lives the same kind of refugee life in the trailer as in the desert. And he’s pretty content, though he admits that it’s hard to convince the ladies to come out to his deep desert Bedouin bachelor pad. Like most of the other desert folk, Garlington works crap jobs for a few months out of the year, socking away a few grand for necessities, etc. The rest of the time he either sits around the homestead reading novels and writing the occasional freelance piece, or he travels. He usually travels during the summer, thus avoiding the 120-degree misery of the summertime desert. Because he lives a Spartan existence without air conditioning, a refrigerator, a big entertainment system, or even a phone line, Garlington doesn’t have to worry about any of the occasional urban yahoos who vandalize the desert stealing things while he’s gone. There’s just nothing worth stealing. The question is, why would anyone want to live like this? Yeah, Garlington is a soul maverick, a lone wolf, an asocial geek. It makes sense that he’d do this. WASHINGTON — The Supreme Court ruled Thursday that Americans have a right to own guns for self-defense and hunting, the justices' first major pronouncement on gun rights in U.S. history. The court's 5-4 ruling strikes down the District of Columbia's 32-year-old ban on handguns as incompatible with gun rights under the Second Amendment. Justice Antonin Scalia, writing for four colleagues, said the Constitution does not permit "the absolute prohibition of handguns held and used for self-defense in the home." In dissent, Justice John Paul Stevens wrote that the majority "would have us believe that over 200 years ago, the Framers made a choice to limit the tools available to elected officials wishing to regulate civilian uses of weapons." Of course they did. After all, the entire Constitution was about limiting the "tools" available to elected (and otherwise) officials wishing to regulate (oppress) the people. He said such evidence "is nowhere to be found." How about here: A well regulated militia, being necessary to the security of a free state, the right of the people to keep and bear arms, shall not be infringed. * "I ask, sir, what is the militia? It is the whole people, except for a few public officials." * "Whereas civil-rulers, not having their duty to the people duly before them, may attempt to tyrannize, and as military forces, which must be occasionally raised to defend our country, might pervert their power to the injury of their fellow citizens, the people are confirmed by the article in their right to keep and bear their private arms." * "The best we can hope for concerning the people at large is that they be properly armed." * If the representatives of the people betray their constituents, there is then no recourse left but in the exertion of that original right of self-defense which is paramount to all positive forms of government, and which against the usurpations of the national rulers may be exerted with infinitely better prospect of success than against those of the rulers of an individual State. In a single State, if the persons entrusted with supreme power become usurpers, the different parcels, subdivisions, or districts of which it consists, having no distinct government in each, can take no regular measures for defense. The citizens must rush tumultuously to arms, without concert, without system, without resource; except in their courage and despair. * "That the said Constitution shall never be construed to authorize Congress to infringe the just liberty of the press or the rights of conscience; or to prevent the people of the United States who are peaceable citizens from keeping their own arms ... "
* "[The Constitution preserves] the advantage of being armed which Americans possess over the people of almost every other nation...(where) the governments are afraid to trust the people with arms." * "To suppose arms in the hands of citizens, to be used at individual discretion, except in private self-defense, or by partial orders of towns, countries or districts of a state, is to demolish every constitution, and lay the laws prostrate, so that liberty can be enjoyed by no man; it is a dissolution of the government. The fundamental law of the militia is, that it be created, directed and commanded by the laws, and ever for the support of the laws." * "Before a standing army can rule, the people must be disarmed; as they are in almost every kingdom in Europe. The supreme power in America cannot enforce unjust laws by the sword; because the whole body of the people are armed, and constitute a force superior to any band of regular troops that can be, on any pretense, raised in the United States. A military force, at the command of Congress, can execute no laws, but such as the people perceive to be just and constitutional; for they will possess the power, and jealousy will instantly inspire the inclination, to resist the execution of a law which appears to them unjust and oppressive." --Noah Webster, An Examination of the Leading Principles of the Federal Constitution (Philadelphia 1787). * "Who are the militia? Are they not ourselves? Is it feared, then, that we shall turn our arms each man against his own bosom. Congress have no power to disarm the militia. Their swords, and every other terrible implement of the soldier, are the birthright of an American...[T]he unlimited power of the sword is not in the hands of either the federal or state governments, but, where I trust in God it will ever remain, in the hands of the people." --Tenche Coxe, The Pennsylvania Gazette, Feb. 20, 1788. * "Whereas, to preserve liberty, it is essential that the whole body of the people always possess arms, and be taught alike, especially when young, how to use them; nor does it follow from this, that all promiscuously must go into actual service on every occasion. The mind that aims at a select militia, must be influenced by a truly anti-republican principle; and when we see many men disposed to practice upon it, whenever they can prevail, no wonder true republicans are for carefully guarding against it." --Richard Henry Lee, The Pennsylvania Gazette, Feb. 20, 1788. * "What country can preserve its liberties if its rulers are not warned from time to time that their people preserve the spirit of resistance? Let them take arms." * "No Free man shall ever be debarred the use of arms." * "The right of the people to keep and bear ... arms shall not be infringed. A well regulated militia, composed of the body of the people, trained to arms, is the best and most natural defense of a free country ..."
* "What, Sir, is the use of a militia? It is to prevent the establishment of a standing army, the bane of liberty .... Whenever Governments mean to invade the rights and liberties of the people, they always attempt to destroy the militia, in order to raise an army upon their ruins." * " ... to disarm the people - that was the best and most effectual way to enslave them." * " ... but if circumstances should at any time oblige the government to form an army of any magnitude, that army can never be formidable to the liberties of the people, while there is a large body of citizens, little if at all inferior to them in discipline and use of arms, who stand ready to defend their rights ..."
* "Are we at last brought to such humiliating and debasing degradation, that we cannot be trusted with arms for our defense? Where is the difference between having our arms in possession and under our direction, and having them under the management of Congress? If our defense be the real object of them under the management of Congress? If our defense be the real object of having those arms, in whose hands can they be trusted with more propriety, or equal safety to us, as in our own hands?" * "The great object is, that every man be armed ... Every one who is able may have a gun." * "O sir, we should have fine times, indeed, if, to punish tyrants, it were only sufficient to assemble the people! Your arms, wherewith you could defend yourselves, are gone ..."
* "The people are not to be disarmed of their weapons. They are left in full possession of them." * "Certainly one of the chief guarantees of freedom under any government, no matter how popular and respected, is the right of citizens to keep and bear arms ... The right of citizens to bear arms is just one guarantee against arbitrary government, one more safeguard, against the tyranny which now appears remote in America but which historically has proven to be always possible." * "The militia is the natural defense of a free country against sudden foreign invasions, domestic insurrections, and domestic usurpation of power by rulers. The right of the citizens to keep and bear arms has justly been considered, as the palladium of the liberties of the republic; since it offers a strong moral check against the usurpation and arbitrary power of rulers; and will generally ... enable the people to resist and triumph over them." * " ... most attractive to Americans, the possession of arms is the distinction between a freeman and a slave, it being the ultimate means by which freedom was to be preserved." * "The right [to bear arms] is general. It may be supposed from the phraseology of this provision that the right to keep and bear arms was only guaranteed to the militia; but this would be an interpretation not warranted by the intent. The militia, as has been explained elsewhere, consists of those persons who, under the laws, are liable to the performance of military duty, and are officered and enrolled for service when called upon.... [I]f the right were limited to those enrolled, the purpose of the guarantee might be defeated altogether by the action or the neglect to act of the government it was meant to hold in check. The meaning of the provision undoubtedly is, that the people, from whom the militia must be taken, shall have the right to keep and bear arms, and they need no permission or regulation of law for the purpose. But this enables the government to have a well regulated militia; for to bear arms implies something more than mere keeping; it implies the learning to handle and use them in a way that makes those who keep them ready for their efficient use; in other words, it implies the right to meet for voluntary discipline in arms, observing in so doing the laws of public order." * "And that the said Constitution be never construed to authorize Congress ... to prevent the people of the United States, who are peaceable citizens, from keeping their own arms.... "
Never mind all the year 2000-type scare scenarios. Just close your eyes for a moment and imagine what would happen if you became ill and couldn't work, or if an earthquake or hurricane or bomb left your community devastated. It happens all the time. When unexpected disasters happen, people who are even a little prepared are much better off than those who have taken their dependence on outside resources for granted. When you imagine the security of not having to worry about going to the store for even a few weeks, a comprehensive storage system begins to make sense. James Talmage Stevens's Making the Best of Basics, now in its 10th edition, is one of the best-known preparedness bibles around. Stevens lays out a yearlong storage program of 15 food and nonfood categories, six of which (water, wheat and grains, dairy products, sweeteners, "cooking catalysts" like salt and oil, and sprouting seeds) are capable of sustaining life indefinitely in a no-frills diet. The other 9 categories are designated "Building Blocks," and improve upon the basic diet and support a more routine, less Spartan existence while relying on stored supplies. (Some of them, such as medical supplies and fuel, will seem as essential to some readers as the first six.) The book's main messages--store what you eat, eat what you store, use it or lose it--are at the core of its calm advice and simple, nutritious recipes. The 10th edition has been updated with a yellow pages section that lists current preparedness resources throughout the U.S. and Canada, including Web resources. Squash, zucchini, carrots, broccoli, green beans, peas, advisability of raised-bed gardening. Beans, broccoli, carrots, sweet corn, lettuce, "guerrilla gardening". I've always wanted to get one of those enclosed utility trailers and convert it to a camper. Here's a video about doing just that. Are you yearning to grow your own sweet, juicy tomatoes? Luckily for you, tomato plants can grow almost anywhere. But as with most vegetation that produce a fruit, a little "tender, loving care" or TLC goes a long way. With adequate sunlight, water, and patience, you'll be greatly rewarded. Buy a tomato plant from a nursery and transplant it to your garden for the first-time grower. More experienced growers will find it easy to start their own tomatoes from seed, beginning, as appropriate, in a greenhouse or sunny window indoors. In most cases, there's no reason to pay extra to buy larger plants. Good first-time growers’ varieties include Better Boy, Creole, Big Boy, Early Girl, Brandywine, Celebrity, Lemon Boy, or just about any cherry or grape tomato variety. Plant several varieties rather than all of one type-- this ensures a steady harvest. As a rule of thumb, it's good to have two plants for each member of the family who will eat tomatoes. If you plan on canning or making salsa, use up to four plants per person. Plants usually cost US$4 or less. Choose a sunny spot to place the plants. Place tomato plants in a site receiving full sun (7 hours or more daily) Tomatoes need lots of warm sunshine for optimum taste. Prepare the garden bed by adding lots of compost (5 to 8 pounds per square foot/25 to 40 kilograms per square meter) to the soil. Turn compost into the top 3 inches (6 to 8 cm). Tomatoes demand a growing medium rich in organic matter. If you don't make your own compost, use store-bought compost or composted manure available in the 40-pound bags. Compost or Manure is usually less than US$5 per 40-pound bag. Transplant the tomato deeply. Bury about 75% of the plant. It’s okay to bury some of its leaves. New roots will emerge along the buried stem, giving the plant a development boost; a new transplant needs to focus on root production. Give each plant about 1 gallon (about 4 liters) of warm water (about 80 degrees F/ 27 degrees C) within ten minutes of transplanting to avoid transplant shock. Space tomato plants 18 to 36 inches (45 to 90 cm) apart; space them half the suggested distance in warmer climates, especially if using tomato cages. The normal distance recommended is for plants allowed to bush out hugely on the ground, while planting closer together in cages allows the plants to shade each other's fruit, helping prevent burn and allowing a sweeter flavor. Don't forget to leave yourself enough space to get in between the plants to water, weed, and harvest. Those cute, little seedlings may not remain that way for long. Continue to water about 16 ounces (about 500 ml) of warm water per plant every day for the first 7 to 10 days after transplanting. Wait a week or two after transplanting,and then place a mulch of straw, dried grass, or pine needles to control weeds and keep the soil moist during dry weather. The mulch should be about an inch (2.5 cm) thick and surround at least a circle 12 inches (about 30 cm) in diameter around the stem. Pine needles are especially good for helping raise the acidity of the soil. Ensure that plants are receiving 1 to 3 inches (2.5 cm to 7.6 cm) of rain weekly. If not, give each plant about 2 gallons (about 7.5 liters) per plant per week, beginning 14 days after transplanting. The tomato plant should be watered 2 to 3 times weekly (so, water each plant with about .75 to 1 gallon each time (about 3 to 4 liters). It's okay in hot or dry weather to water even more frequently with larger volumes. Consider using a tomato cage or a stake to support the tomato vine about 14 days after transplanting. A stake should be at least 0.5 inches (1.3 cm) thick and 6 to 8 feet (1.8 to 2.4 meters) long. Pound stakes about 12 to 24 inches (30 cm to 60 cm) deep, at least 2 inches (5 cm) away from the plant. Secure the plant to the stake using loose knotted double-loops that won't strangle the plant. Stakes can be made of bamboo, scrap wood, electrical conduit, or iron bar. While it is less common, they can also be vined on a trellis or fence, like grapes, beans, squash, and other vining plants. This can produce especially large yields, but is less popular because tomato plants grow so large and bulky. A cage should be at least 48 inches (1.2 m) tall, even taller if you grow the plant well. Some tomato plants can be more than six feet (1.8 m) tall in cages. Cages have a tendency to bend if the plants get heavy, and sometimes collapse in summer storms. Carefully pull leaves and secondary stems inside the cage as the plant grows. Cages cost less than USD$4 each. If your plants routinely outgrow purchased tomato cages, get some hardware cloth (wire mesh) with a broad grid and cut it and roll it into wide cylinders to make your own, larger cages. Bend the wire ends around the wires on the opposite end, making a circle. This type of cage may need a strong stake for support. Choose whether to use use chemical fertilizers. Tomatoes can grow very well organically, provided the soil is well enriched with organic matter. If you do use chemical fertilizers, try using half the recommended concentration per gallon (using package directions), but fertilize twice as often, in order to avoid the stress caused by the feast-famine of the longer fertilization gaps. Over-fertilization can cause plants to grow too quickly, leaving them more susceptible to disease and insects. Remember that your goal in growing tomatoes is fruit, not leaves. Fertilizers, especially when used in excess, may cause the plant to produce more leaves and foliage. Shake your plants gently once or twice each week for about 5 seconds once flowering begins. According to the National Gardening Association, shaking the tomato plant increases fruit production by more evenly distributing pollen. Watch for fruit to appear 45 to 90 days after transplanting. Tomato plants usually have small, green fruit to start. Wait until the fruit is of good size with a bright, deep coloring. This means that the fruit is ripe and ready to pick. The texture of the fruit can also determine if it is ready to pick. Ripeness is usually determined by a slight softness. Be careful not to squeeze too hard and bruise the fruit. Also, be careful of allowing it to become overly ripe, which results in a very soft tomato. For those who live with little ground space, or only a porch: plant tomatoes using only a pot! Take a pot about 18-24 inches high, about 15-20 inches wide. Fill with soil, fertilizer, etc. 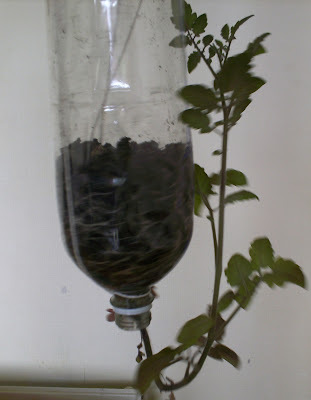 Plant tomato and cover soil with plastic black cloth that lets water through small holes. Cut around the edge in a circle and tuck the edge into the soil. This keeps weeds and bugs out. Buy long plastic stakes and put 3-4 into pot around plant and use plant tape to hold it. Ripe tomatoes can be protected from predators by carefully placing a "Ziploc" type bag over the fruit from the bottom to the stem. Close the bag from both ends at the top to the stem-leaving a 1/4" on each side for air flow. Cut the lower corner for drainage and air flow. Don't be disappointed; spend the time bagging it! Another fun idea for the space-restricted gardener is to start an upside down plant. Tomatoes prefer a soil pH range of 6.0-6.8. Blossom-end rot can be caused by a calcium deficiency and occurs frequently on acid soils or during stress periods on soils with seemingly sufficient calcium. Source: Tomatoes Ohio State University. To correct a calcium deficiency: bring about one gallon (about 4 liters) of water and a tablespoon (15 ml) of lemon juice to a boil. Add six tablespoons of bone meal to the water, stir well, cook covered for 30 minutes to help dissolve. Allow to cool. Solution may not be completely dissolved, that's okay. Feed each plant at leaves and roots one quart (about 1 liter) of solution. Repeat treatment a second time in three to five days. Bone meal is high in calcium and phosphorus. Fruit may be picked any time after it starts changing to its ripe color and set on a sunny windowsill to ripen indoors. This will reduce the chances of it rotting on the vine or being eaten by a bird or squirrel. Tomatoes do, however, taste sweeter when ripened on the vine, so you need to balance risk of threats versus taste. Use a tomato cage or tomato stakes after the plant has been in the ground for six weeks to make harvesting easier. Prior to setting your seedling in the ground, toss a couple handfuls of organic material in the bottom of your planting hole. As the roots grow deeper, they'll hit this layer of nutrients just in time to really boost your fruit output. When planting in the ground, you can place a large coffee can (opened on both ends) over the plant and push it halfway into the ground. When watering, fill the can to the top with water, which will then descend directly to the roots and allow the plant to flourish. Check for "suckers" (branches that grow in the joint between the main stem and other branches). There is a myth that suckers do not produce fruit; this is not true, but they do use some of the plant's nutrients as they grow. As a general rule, leaving suckers will produce more fruit, but smaller, while pinching them off will cause the plant to grow larger fruit, but less of it (because there will be fewer branches). Purchasing Organic plants from your local farmers market can help ensure that your plant is free of pesticides and other possibly harmful chemicals. You can get started earlier in the year by creating a temporary greenhouse. Make or buy cylindrical tomato cages made of heavy duty fence material. Use vinyl coated welded wire with a 3"x5" mesh, 5 ft. tall and about 1'6" in diameter. Plant the seedling and sink the cage into the dirt 4-6". Then take some sturdy, clear plastic (available in the garden center) and tape it securely to the cage. Moisture is retained and the plants are kept nice and warm. Remove the plastic when the plants emerge from the top of the cage or begin to form fruit, whichever happens first. Use manure tea for fertilizer. If you have access to well rotted manure, you can make your own fertilizer. Put the manure in pantyhose or cheese cloth. Place the "tea bag" in a 5 gallon bucket and fill the bucket with water. Allow the "tea" to steep for a few days. Dilute the tea 1:1 with water and give your plants a drink...They'll love it. If you're near the ocean, you can also use sea kelp for the same effect. Kelp is a good fertilizer for foliar feeding; spraying directly on the leaves, because it contains trace nutrients and hormones which are more easily absorbed through leaf pores, instead of indirectly through the roots. While you should avoid pouring too much coffee or fresh grounds into the soil for acidity, the very caffeine which makes this risky is also poisonous to slugs and other pests, which is why coffee plants evolved it. Even more effective than killing these pests is to simply spray the leaves of the plant with coffee. On the leaves, the caffeine is not concentrated enough to harm the plant, but is still enough to repel some pests. If the stem or roots of the plant are damaged -- for example your toddler sits down on top of your 18 inch plant, snapping it near its base -- you can often save the plant anyway, by burying much of its above-ground stem and lower branches again, as you did to 75% of the plant when you first placed it in the ground. The little hairs on the stem and branches grow into roots. Since the plant is already in the ground, you accomplish this by piling dirt up around the plant, so that it grows out of a mound. Raised-earth growing is good for tomato plants at any time, because they are more vulnerable to certain ailments, especially fungus, when their hanging leaves and branches are in contact with the earth. In order to improve flavor, promote growth, increase harvest, and protect from insects, consider using companion plants with your tomatoes. Planting basil within 18 inches of your tomato plant, for example, improves the flavor of its fruit and repels many insect pests. Carrots increase fruit production, because the tomato plant draws nutrients from the carrots (which may grow smaller as a result). Basil also makes a wonderful addition to tomato-based dishes. Try adding it to your spaghetti sauce or bruschetta. If temperatures routinely get above 95 degrees F (35 degrees C), consider shading the tops of each plant from 11 to 3, to reduce the "burn" caused by the combination of heat and sunlight. If you do decide to sucker (cut back) your indeterminate tomato plants, consider not pinching off the whole sucker, but letting it grow just long enough to produce some leaves, then pinching off its tip. This will keep it from putting much effort into growing a long branch, but lets the first few leaves increase the surface area available to your plant for photosynthesis. Suckers that have been pinched off can also be rooted quite easily in moist soil to produce new tomato plants, but this practice does require a larger sucker, and is somewhat impractical in climates with a short growing season, since these plants will reach maturity later in the season and have less time to yield. Tomato plants love the heat and will grow rapidly once their roots are established. Tomato roots like the soil to be warm before they will really take off. Prepare your location as you normally would with organic matter. Make a very shallow trench that is not quite as long as your tomato plant is tall (pot included). At one end of the trough dig deep enough so that the pot when laying on its side can be mostly covered. This deeper side is to accommodate the plant ball only. On one side of the plant stem (on one side only) gently scrape from the root ball up 4/5th's of the way up the stem so that the outer skin is scraped off down to the firm part of the stem. Be gentle so that at the upper fifth of the plant is not broken. While you scrape the stem you will want to support it in the palm of your other hand. Then place the plant on its side in the trench. Place the plant scraped side down in the trench with the root ball being placed in the deeper side of the trench. The plant stem should be about 1/2" from the surface. Cover almost the entire plant with dirt leaving the tip 1" exposed. Mound some dirt up like a small pillow for the exposed section so that the tip is facing up - it does not need to be pointing directly at a 45 degree angle. Once again, be gentle especially with the top growing end. Gently press down on the soil to assure the scraped side will be in contact with the dirt Water thoroughly and add additional dirt if needed to assure the root ball is covered. By scraping the stem you are exposing the cell layer that will grow roots, by planting close to the surface the plant gets the heat that it loves. The root system will ultimately grow its way down into the soil. It does not take long before you have a very strong root system that will more than support the green part of the plant. As the roots develop you will see your plant grow very quickly providing an abundant number of vigorous stems and blooms. The reason for the shallow trench planting is that tomato plants love warm soil. When a hole is dug and the root ball is planted deeply, the roots will be slower to grow since the soil deeper down does not warm up as early as the surface soil. It is best to mulch well into the summer when the soil is very warm and you need to retain moisture and discourage weeds. A determinate tomato plant grows to a certain, limited size and then stops or at least slows its growth greatly. An indeterminate plant keeps growing and spreading out. Tomatoes are prone to a number of diseases, but you can avoid most of them very easily. First by planting disease resistant varieties,listed on the tomato package. To prevent mold or fungal diseases, water plants in the morning, preferably by using drip irrigation or water furrows. If you spray the entire plant(s) from above, you will increase the chances of mold/fungal spores infecting it/them. Exception; There is a method of fertilizing plants called Foliar Feeding, where you spray the plant's leaves with fertilizer containing trace elements, which will be directly absorbed. This is good for the plant, though it should be done in the evening or morning, when its pores are open. Only eat the fruit of a tomato plant, never anything else, as tomato vines are in the highly poisonous Nightshade family. Tomatoes need good weather and soil conditions to produce good fruit. When transplanting, be careful not to disturb the roots. If too many roots are cut or damaged, the plant may die. See "tips" above for how to fix root or stem damage. As your plants flourish and grow, string, or cord tend to cut into the branches. Instead, try using torn strips of cloth for your garden tying needs, and especially when cinching up tomatoes. Cut-up strips of old hose or stockings work great for tomato ties; they are stretchy and gentle enough to tie vines well. One pair of 99-cent pantyhose in 1/2-inch strips will hold up rows of plants. Never sucker (prune the new growths at the base of each fruiting branch) determinate tomato plants. This kind of plant sets its fruit all at once, and all you will accomplish is making your crop much smaller. Seeds of tomato are pretty small and their planting depth should not be too deep. A deep sowing results in less or no emergence and as a result loss of seeds may be attained.It is therefore wise to cautiously follow the planting depth of seeds and this has to be a 0.5-1.5cm. Composted manure. Available in 40-pound bags from nurseries, garden centers, or hardware stores. Tomato stakes (bamboo, iron rebar, wood) or tomato cages. Article provided by wikiHow, a collaborative writing project to build the world's largest, highest quality how-to manual. Please edit this article and find author credits at the original wikiHow article on How to Grow a Tomato Plant. All content on wikiHow can be shared under a Creative Commons license. You can grow your own peas or beans, whether in a garden or a pot. They're both legumes, which means that their symbiotic relationship with nitrogen fixing bacteria makes them high in protein, and they have very similar requirements. Since they're relatively easy to grow, they're a good choice for a first-time gardener, a new garden plot, or a child learning to garden. Pick your vegetables ten minutes before eating them, and discover what they are supposed to taste like! Decide on the number of plants you want. A 10" (25cm) pot will hold one or two plants, a 'veranda planter' (about 2" by 10") will hold 4 or 6 plants easily. If you have a garden, plot out the needed space according to how many plants you want. Even a few plants can provide enough for snacking and salads. If you want to stir fry for the whole family, plant a few more. Choose a good location. For the peas, locate the plot or pots in a bright area but not in full sun. A spot partially shaded by a tree or hedge is ideal, because the leaves will provide more shade as the season gets hotter. Make a sun chart to determine which parts of your yard or patio get the most sun--and don't put these plants there (especially the peas, which prefer cooler climates). Get some seeds. These are the peas or beans themselves, of course, but you'll need relatively fresh ones. Peas or beans from a farmers' market will work fine; fresh ones from the supermarket might work, but probably many will fail to sprout. Frozen or canned are useless. Dried beans may work, but you'd do best to go organic (to make sure they haven't been treated not to sprout). For dried beans, test them first - soak some in water then put them into a damp paper towel and fold it over. Keep the towel just damp (splash it with water once a day or so), and in two or three days open it up and look. If there are little sprouts poking out of the split beans, you're fine, go ahead and plant them (in fact, plant those sprouted ones! ); if the beans look exactly the same, give them another couple days and if that doesn't work find another source of beans; and if the beans have gotten moldy you can try again to sprout them using less water, but you'll probably need another source of beans. Prepare the ground - put dirt in the pot (ordinary potting soil, from any garden store, will work fine), or dig up the ground where you want to plant. You need about 6 inches (15 cm) of loose, rich soil - if your ground is mostly clay or sand, you'd probably have better luck in a pot. Or buy some compost and topsoil, mix it with the dirt you dug up (about 50/50) and put it back so it mounds up. If you do this for three or four years, you can turn bad soil into good - but don't expect too much of a harvest for the first year or so. You can also add vegetable fertilizer to either the ground or a pot - but it's probably not necessary. Plant the seeds. If you buy actual seeds in a packet meant for planting, they will say to plant two or three together, and then pull up all but one when it grows. You can do that - but if you don't remember to pull it up, the plants will compete for nutrients and die. Otherwise, plant one in each hole; some don't come up, so plant more than enough so that you will still have enough, even if a quarter of the seeds don't germinate. Plant the seeds by taking one, pushing your finger down into the (nice, loose, rich) soil you're planting to about to the first joint (1-1.5", 2.5-5cm), and putting the pea/bean into that hole. Pat the soil down gently over it (to ensure soil contact, which is critical for germination), and gently water it. Plant the next one about 6" (15 cm) away (further is fine, don't crowd them though). Peas should be planted about six to eight weeks before the last killing frost (soil temperature of 50°F/10°C or higher). Some peas (snow peas and sugar snaps) like cool temperatures. They're really a spring and fall plant, in most climates. In cool climates they might survive the summer in a shaded spot, in very hot climates they may be a winter only planting. In the San Francisco Bay Area, they grow well planted in February and produce peas until late May or early June, then die off. Plant them again in September/October (while it's still warm) and they'll produce through December or January. Other peas and most beans have different temperature requirements. Some want heat and full sun. Read the seed packet and catalog or look up your chosen variety. Plant the beans about one or two weeks before the expected date of the last killing frost in the spring. Look for soil temperature that's reliably over 60°F (16°C) as a cue. Keep in mind that varieties with colored seeds are more likely to germinate in cool soils than varieties with white seeds. If planting a large area with peas or beans, doing so by hand can be back breaking work. Consider using a wheel planter (as shown) or a planter that attaches to the back of a tractor. Provide a support. Most peas and beans (except "bush beans") are twining plants. You will therefore need something for them to twine on: a fence, a net strung between two poles, individual poles for each plant, or a bean tepee (made of 3-4 bamboo poles tied together at the top). It's best to have a support ready as soon as you plant and "plant" it when you plant the seeds. The support can help mark your seed locations. Water the seeds. A 'rain' spray on a hose or watering can will do, or pour water on your hand and sprinkle it over where the seed was planted (a marker made of a craft stick or piece of plastic can help find them before they sprout). Don't run the hose directly onto the seeds; they'll either wash away or drown. Water them at least daily, and more often if it's dry, but don't water them if you get your finger wet/muddy by pushing it into the ground near a seed - it should be damp to dry. Too much water is as harmful as too little. Keep watering daily and watch for the sprouts. Depending on what you planted (pre-sprouted dried beans, fresh, dried for planting...), it can take 2 to 10 days for the first sprouts to show above the surface. As soon as the sprouts can reach (1 to 2 inches tallattach them to their twining surface (pole, net, whatever). If you let them fall over, a) they may rot on the surface and b) they may twine with other peas and it's very difficult to separate them without breaking branches. Keep checking them and encouraging them to grow up the twining surface every day when you water them. They grow fast! At this point they can take more direct watering, but still don't run the hose right on them. Tender pea shoots are delicious, raw or cooked. When the peas are 4-6" or 10-15cm tall, you can cut off the first two "levels" of leaves and bring them to the kitchen. Don't cut more than the first two sets of leaves, though--the stem gets fibrous as it grows, and you want to cut the top where it is still tender. The pea plants will grow back, and you can get several harvests out of them for greens. Flowers will begin to show a couple weeks after the sprouts come up. Beans and peas flower in lots of different colors, including white, pink and purple, so you could even sneak some into a flower garden for show. When the flowers dry up, a pea/bean pod will begin to grow from the same place. Some peas (snow peas, sugar snap peas) are 'edible-podded' - this means that you can pick them while they're young and flat and eat them pods and all. Raw or gently stir-fried are both delicious. Green beans are also edible-podded, and can be eaten even after they've plumped up. For other peas and beans, wait until the pods are round and you can see the little bumps from the peas/beans inside. Pick them, open the pods and use the peas/beans inside. Pick them the same day you intend to use them - as soon before eating as possible. The flavor begins to fade as soon as you pick them. Pick pods before they get too old. One taste of a too-big pod will tell you why. They're not harmful to eat, but they're not very tasty, either. The texture is coarse and pithy and they lose their sweetness. Leave a few pods to mature completely near the end of the growing season to save the seeds for next year (see tips). There are a lot of types of peas/beans. Get a gardening book out of the library, and look at what there is before you go to buy seeds. Or check seed catalogs - they often describe the sort of plants. You need to know space requirements, sun requirements, temperature requirements, whether they give one big harvest or produce gradually, how long they'll live. Another choice is to find a nursery or seed shop near you and ask a knowledgeable person there. Local nurseries often know things about the local climate and soil that aren't in general gardening books, and they may be able to help recommend things like planting times and varieties suited to your area. Some peas/beans are 'determinate' - this means they will flower and make peas all at once. You will get one large harvest, then the plants will die. Others are 'indeterminate' and will set flowers and make pods for as long as they grow (several weeks to several months). You won't get as many pods at one time - usually not more than 5-6 ripe pods per plant per couple of days - but you'll get them for much longer. This also determines how many plants you want to grow. Assuming you are growing indeterminate peas, two plants will generally make enough for one person (for a side dish) every couple of days, so calculate how often you will want to eat the peas/beans and how many people you'll be feeding to decide how many plants to grow. For determinate beans, either you get one good meal out of them or you do something else with them, like dry the beans or can them, and again you need to decide how many/how much you want to deal with. One thing you can do if you have too many ripe peas - wait until it's really really ripe (the stem is starting to dry, or the pod splits), pick it and open the pod, then put the peas in a cool dry spot and let them dry. Plant those seeds next year! Most peas/beans are subject to powdery mildew and other pests. If you see a white film or dust on a few leaves, cut off the affected branch, even if it has peas or flowers on it, and throw it away. Don't compost it or leave it near any plants. It is possible to catch an infestation early and deal with it, but if most of a plant is infected pull it up and throw the whole thing away - then watch the plants near it very carefully. If you get a bad infestation, don't plant peas or tomatoes in that bed/dirt next year. They'll be infected from the start. If you don't deal with it, the leaves and stems start drying up and turning brown (very like they do when the plant dies of heat or old age), and the whole plant dies quite quickly (and the mildew spreads to the plants around!). Similarly, if you see bugs on the peas - small green or brown ones (aphids), or tiny white flies (whitefly), or something that looks like white fuzz on the underside of the leaves (another kind of whitefly) - at minimum wash it off with water and oil soap. If it's all over a branch cut off the branch and throw it away and wash the branches nearby, and if it's all over the plant pull up the plant and throw it away. Look in gardening books for other diseases and pests that affect peas and beans. Different plants have different vulnerabilities. Go easy on fertilization. Remember that peas and beans can obtain their own nitrogen. If you provide too much nitrogen in the form of fertilizer, the vines will get big but there won't be as many beans and peas to harvest. Article provided by wikiHow, a collaborative writing project to build the world's largest, highest quality how-to manual. Please edit this article and find author credits at the original wikiHow article on How to Grow Beans and Peas. All content on wikiHow can be shared under a Creative Commons license. Some fish require live food to survive; some require live food to breed. Raising mosquito or midge larvae for this purpose is free, simple to set up, and requires minimal work. After you've determined that doing this will not violate any local laws and regulations regarding public health  all you'll need is a bucket, water, and some sun. Find a bucket or plastic barrel. A 5 gallon bucket will work, as will a 50 gallon barrel. It is possible to collect 30–40 larva per day from a 35 gallon barrel.A black bucket will get warmer earlier but it may get too hot in mid-summer. When the temperatures reach a high of 80°F, move the bucket to a place that is in shade all day. The indirect sunlight will still allow the algae to grow. Algae is the main food source for the larvae.Alternatively, you can use a 5 gallon or 10 gallon fish tank so you can see the larvae better and reach the ones that escape to the bottom of the tank. An acrylic tank will be more suitable for outdoor use. Put the bucket outside and allow it to fill with rainwater. Or, if it's wintertime, fill it with snow to melt in warmer weather. If you fill it with water from the garden hose, be sure to use a dechlorinator to neutralize chlorine and chloramines. Chlorine will prevent algae growth, which will deprive the larvae of food. Put the bucket in the sun. This will warm the water and allow algae to grow. You want your water to look like green pea soup. Algae growing on the sides of the bucket is not what your larvae eat. They need the algae that makes the water green. Wait until the midges and mosquitoes lay tiny rafts of dark brown eggs (about the size of a sesame seed) on the surface of the water. If you can find the tiny, 3mm football-shaped, dark brown egg rafts, you found a bonus! Put these in your tank and the fish will eat the wigglers as they hatch into the water, usually within 48 hours. If you don't move them to the fish tank, they'll hatch and the larvae (aka "wigglers") will grow and eat the algae. As the larvae mature, they become comma-shaped with two tiny antenna. When they reach this shape, be sure to feed them to your fish. Remember, wigglers go from egg, to water larvae, to pupae ("tumblers"), then to flying adult. Whatever you do, do not let them reach the flying adult stage as mosquitoes and some midges are not only a nuisance, but they can transmit diseases to animals and humans alike. See Warnings below. Net the larvae every few days to prevent them from developing into pupae (and then into mosquitoes or midges). The warmer the weather, the faster they'll develop. While you're at it, look for other sources of standing water where larvae might be developing (old tires, driveway puddles, unfiltered fish ponds, empty flowerpots, and any item that can hold water for more than a few days at a time). Net out the larvae and dump the water so that mosquitoes don't breed there anymore. See Warnings below. Net out larvae using a brine shrimp net. The netting is very fine and looks like t-shirt material. A regular fish net may not work as well because the larvae could slip through the holes. Use one or more buckets (one empty, the other one(s) full of water and mosquito). Set the fish net on the rim of the empty bucket and pour the entire content through the net, letting the water drain into the empty bucket. All larvae of a certain size will be skeined back and can be fed to your fish. All the ones too small will slip through and continue to grow out. Using this method, you will need to collect at least every other day so that you do not allow the development of pupae and adult mosquitoes or midges. Sometimes you will find little hollow mosquito shaped floaters. These are the skins. They are not dead larvae. Larvae need to shed their skins just like other insects. Adult mosquitoes and midges look exactly alike and so do their larvae. It takes a microscope and highly trained biologist to tell the difference. Some midge larvae float on the surface like mosquitoes, some midge larvae are red and sit on the bottom of the bucket. Use a new or clean food grade bucket. Do not use one that has held paint, tar, or other chemicals as the chemicals will poison the algae or larva. Even if you clean it, traces of the chemicals will still be there. Some countries do not allow bringing up larvae, especially in South East Asia. Countries such as Singapore and Malaysia have very strict laws regarding raising mosquitoes and violations are strictly punished. Article provided by wikiHow, a collaborative writing project to build the world's largest, highest quality how-to manual. Please edit this article and find author credits at the original wikiHow article on How to Raise Mosquito Larvae for Fish Food. All content on wikiHow can be shared under a Creative Commons license. "As I watched my Subaru Legacy slide backward toward my new ranch’s studio outbuilding, the thought crossed my mind that if it kept going— and I didn’t see why it wouldn’t—at least I would be using less gasoline. A few days after I moved into the sprawling, crumbling, forty-one acre New Mexico spread that I had named the Funky Butte Ranch (it had a funky limestone butte on its east side where two great horned owls with an active love life nested), I neglected to firmly apply that last click to the parking brake on my aged fossil fuel–powered hatchback, the LOVEsubee. 4. Don’t starve, electrocute myself, get eaten by the local mountain lions, get shot by my UN-fearing neighbors, or otherwise die in a way that would cause embarrassment if the obituary writer did his or her research." "I didn’t need the message hammered home so literally. The time was absolutely right for me personally to embark on this adventure in living green—other than having no electrical, plumbing, building, engine mechanical, horticultural, or animal husbandry skills at all, that is. After growing up on Dominoes Pizza in the New York suburbs, at age thirty-six I wanted to see if a regular guy who enjoyed his comforts could maintain them with a reduced-oil footprint. In concrete terms, this meant raising animals and crops for my food, figuring out some way besides unleaded to get anywhere, and making bank account–draining investments in solar power. I’d lived and worked in extreme conditions on five continents since the beginning of my career as a journalist fifteen years ago, but time and again, after shivering in Alaska and dodging bullets in Tajikistan, I reaffirmed what I already knew: I like my Netflix, wireless e-mail, and booming subwoofers. In fact, I didn’t want to live without them. I just wanted to power them by the sun. If my ear- melting music could go solar, and still make my UN-fearing neighbors complain about bass lines interrupting their nightmares of Hillary Clinton, I’d consider this experiment a success. If I had reliable Internet and could download movies into my green world to boot, the feeling would be closer to “Eureka!” Especially if I was eating munchies I’d grown, raised, or at least bought locally. Because as I saw things, global climate change, pollution, world wars, and human rights aside, the Oil Age has had a great run: fossil fuels turned the United States, for example, from a nation of farmers into the Jetsons. I largely welcome this. I know I sure dig my laptop. When else in history could I have listened to Malian drumming or Beatles outtakes (or some DJ mixing the two) all within three clicks? When else could I be that DJ? This really is the best time ever to be alive, if you’re fortunate enough to live in the West and not be in the armed forces. In short, I wanted to prove that green Digital Age living was possible, and I was psyched to get cracking." Like many Americans, Doug Fine enjoys his creature comforts, but he also knows full well they keep him addicted to oil. So he wonders: Is it possible to keep his Netflix and his car, his Wi-Fi and his subwoofers, and still reduce his carbon footprint? In an attempt to find out, Fine up and moves to a remote ranch in New Mexico, where he brazenly vows to grow his own food, use sunlight to power his world, and drive on restaurant grease. Never mind that he’s never raised so much as a chicken or a bean. Or that he has no mechanical or electrical skills. Whether installing Japanese solar panels, defending the goats he found on Craigslist against coyotes, or co-opting waste oil from the local Chinese restaurant to try and fill the new “veggie oil” tank in his ROAT (short for Ridiculously Oversized American Truck), Fine’s extraordinary undertaking makes one thing clear: It ain’t easy being green. In fact, his journey uncovers a slew of surprising facts about alternative energy, organic and locally grown food, and climate change. Both a hilarious romp and an inspiring call to action, Farewell, My Subaru makes a profound statement about trading today’s instant gratifications for a deeper, more enduring kind of satisfaction. When emergencies or outdoor adventures take you off the grid, you need a device that can fill multiple needs. The Etón FR-500 is a compact unit that you can easily store in a safety kit or toss in your rucksack and take anywhere. It functions as an AM, FM, shortwave, and NOAA weather radio. Additionally, it also has a flashlight, an emergency beacon, and an emergency siren. Plus, you can use it to charge your cell phone or MP3 player. Battery and AC power are always options; however this little wonder can also be powered with the hand crank or solely by the solar panels, making it a very "green" device. Tackling the great outdoors can be a daunting task. The Etón FR-500 is designed to keep you in touch with the rest of the world, even when you are miles away from civilization. 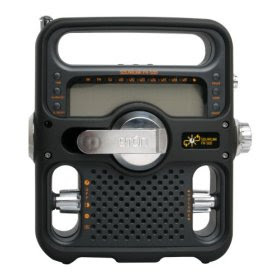 It combines a quality AM/FM tuner with a long-range short wave radio that can pick up broadcasts from thousands of miles away; providing you with news, entertainment and public service announcements. Not only that, but it also has a NOAA Weather Band receiver that can provide weather forecasts, alerts and other emergency messages--information vital to backpackers and travelers. A telescoping antenna provides maximum range and reception for all radio functions. The Etón FR-500 offers multiple communication options, maximizing your ability to stay connected with others no matter the situation. During the day, a built-in siren can emit a loud "SOS" tone to announce your presence. Long-distance signaling at night can be achieved by activating the bright red magnified LED signal beacon. The FR-500 also comes equipped with a bright four-LED flashlight, ensuring that you'll never be left in the dark. The red LED signal light can also be used, allowing you to see without affecting your night vision. The Etón FR-500 is ruggedized for outdoor use, and is more than ready to go in emergency situations. Clever case design protects the analog controls from damage, while rubber gaskets and plugs help keep moisture out of the unit. The easy-to-read backlit LED screen is recessed to keep it from being damaged. It displays radio and battery status, and also incorporates an alarm clock with snooze and sleep functions. Having a device that sports multiple modes of communication means nothing if there is no way to power it. Etón has designed the FR-500 with that thought in mind, and it can be powered in several ways. The built-in rechargeable battery pack can be charged from the integrated dynamo hand crank, or from an optional AC adapter. An array of waterproof, shatterproof, high-performance glass encapsulated amorphous solar cells can also run the FR-500. They are efficient enough to power the unit whenever the sun is up, even in overcast weather. Finally, three alkaline batteries can be used for on-the-go convenience. These multiple power supplies can also be used to recharge cell phones with the Etón charging cord--available by returning the included card and specifying your phone's model. Something he didn't mention is that if you have a cast iron anvil, you can preheat it in a fire or something, and weld a thick steel plate (half inch or thicker) to the top of it to get a better working surface and a little more weight. In fact, some anvils used to be made that way. But, as he pointed out, a plain cast iron anvil will get you by. I went to the Harbor Freight site and searched for the anvil he mentioned, but they didn't have one like that listed. The largest they list is a 55 lb anvil for $50.99, and it's cast iron. I know, because I have one. Then I went to Northern Tool and searched, and they have a 70 lb cast iron anvil for $49.99 so if ya gotta settle for cast iron, that's the one to buy. Northern Industrial Cast Iron Anvil  70-Lb. Grow something useful! Urban gardening and homesteading. A video tutorial on canning beans. For all of human history, people have managed to feed themselves, either by fishing, hunting, gathering and/or subsistence farming. 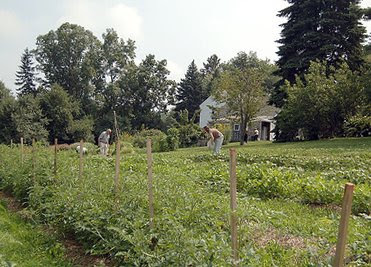 Now, with large-scale food production, gardening is often only a hobby. But growing one's own food could mean increased security, health, and enjoyment. Since the details of growing your own food depend on your unique locale, here's a general overview to get you started. Determine what crops you can raise in your location. Obvious factors include climate, soil, rainfall, and available space. Here are some details on each. Climate. Some locales only have a brief growing season, such as Northern Europe and Canada. This means growing quick producing plant varieties that can be harvested and stored for the winter. Other areas have year-long warm weather, where fresh vegetables and grain can be harvested on demand. Soil. Depending on the type you have available, you may expect very high yields from a small area, or meager yields from large areas. The best plan to follow is to plant a food crop which flourishes in your conditions as a staple, and use surplus land to grow "luxury" foods that require more fertilisation and effort. Rainfall. Some plants thrive with minimal rainfall, but most food crops require substantial amounts of water from irrigation or rainfall. Consider the normal rainfall rate for your area, and the availability of irrigation when choosing crops. If you live in a dry area, consider collecting rainwater. Space. If sufficient space is available, you may be able to grow plenty of food using conventional methods, but where space is limited, you may have to look at other techniques, including hydroponics, container gardening, sharecropping, and vertical gardening. Understand how a growing season plays out. Growing food is more than just planting seeds and waiting for a harvest. Below, in the "Growing" section, is a typical sequence of steps in growing a single crop of one plant. You will need to prepare each different plant crop basically the same way, but when you have prepared the soil for planting, you can plant as many different crops as you like at one time. Become familiar with the different types of food crops. We often think of the vegetables we see in the produce section of a market as the garden vegetables, and in a sense, this is true, but to truly grow your own food, you need to consider your whole diet. This is a general list of the types of food you will want to consider growing. Proteins. Legumes are a good source of proteins. So is meat. Even families who don't eat much meat often decide to raise a few animals such as chickens in order to have eggs. Chickens can be fed mostly on the waste from a family garden, they will eat vegetable peels, stale bread, and many other things you might otherwise throw out or compost. When chickens stop laying, it's time to plan a chicken dinner. Carbohydrates. Potatoes and beets are an excellent source of complex carbohydrates, as well as minerals. Vitamins and minerals. Leaf vegetables, like cabbage and lettuce, as well as vining vegetables like cucumbers and squash, are a good source of many essential vitamins and minerals. Fruits. Most people understand that fruits are a great source of vitamin C, but they also contribute many other vitamins and minerals to your diet, as well as offering a broader variety of taste to enjoy. Fruits also can often be preserved by drying or canning, so refrigeration is not required to store your surplus. Corn. Often eaten as a vegetable with meals, corn is also a versatile grain that can be stored whole, unshucked, shelled (removed from the cob, with whole kernels), or ground into meal for use in making breads or mush dishes like grits. Corn is probably the easiest grain to grow for the home subsistence farmer. Freezing corn is the easiest way to preserve it for winter use. Wheat. Most people are familiar with wheat, from which we get most of our flour for baking everything from breads to cakes and pastries. Wheat stores well after harvest, but harvesting itself is more laborious than it is for corn, since the whole plant is usually cut down, sheaved (placed in piles), gathered and threshed (beaten to free the seeds), and ground into fine powder (flour). Oats. Another grain, oats for human consumption are processed more than wheat or corn, and the labor involved in harvest is equal to wheat. Still, it may be considered an option in some areas where it is easily grown. Rice. For wet areas, areas subject to flooding, or which can be flooded, rice is the obvious choice. Rice is commonly grown in shallowly submerged soil, and is harvested much as wheat is. Other grains include barley and rye, which are similar to wheat and oats. Select the crops and varieties that are suitable to your growing region. This is where the instructions in this article cannot suffice to give comprehensive and accurate information specific to you. Instead, we will look at basic growing requirements for different plants according to standard growing regions, as set forth by the USDA (United States Department of Agriculture) on their plant hardiness map which you may be able to use by comparing climates in terms of latitude and elevation to your particular region. Beans, peas, and other legumes. These are planted after the threat of frost, and require 75 to 90 days to produce fruit, which can continue producing as long as the plants are cared for until autumn frost. Gourds. This group of plants includes squash, melons, and pumpkins, and is planted after the last expected frost, and takes between 45 days (cucumbers) to 130 days for pumpkins, to produce harvestable fruit. Tomatoes. This fruit (usually grouped with vegetables) can be planted in containers if kept warm, and transplanted into soil after the threat of frost, and will produce season-long as well. Grains. There is a great difference in growing seasons with grains, as well as summer and winter varieties of many of these. Generally speaking, summer grains, such as corn and summer wheat, are planted near the end of winter when freezing temperatures are not expected to continue for more than a few weeks, and they take about 110 days to mature, then another 30-60 days to dry sufficiently to harvest for storing as seed. Orchard fruits. Apples, pears, plums, and peaches are regarded as orchard fruits in most places, and do not require annual planting. The trees that bear these fruits require pruning and maintenance and usually take 2-3 years before producing their first, modest crop. When the trees begin producing fruit, the yield should increase yearly, and after they become mature and established, a single tree can produce bushels of fruit each year. Develop a "farm plan" on the land you intend to use for your food production. You will need to address specific issues in your planning, including wildlife encroachment, which may require fences or other permanent measures, sun exposures, since some plants require more sunlight to successfully produce than others, and topography, since tilling very steep ground is wrought with problems. List all of the possible crops you will attempt to cultivate on your land. You should try to have as diverse a selection as possible to meet nutrition requirements mentioned earlier. You may be able to estimate a total yield per crop item by researching the growing success of others in your area, or by using information from the source you purchase your seed from. Using the list, and the planting plan you began earlier, you will need to calculate the amount of seed you will need. If you have lots of room, plant an excess to allow for poor performance until you have a firm grasp of what you are doing. Plan to use your land as effectively as possible if you are limited in space. Except in very cold regions, you may expect to be able to grow and harvest summer, fall, winter, and spring crops. This will allow you to enjoy some fresh produce year around. Beets, carrots, cauliflower, snow peas, cabbage, onions, turnips, collards, mustard greens, and many other vegetables actually prefer growing in cold weather if the ground does not freeze. Winter crops are also much less subject to insect problems. If you are very tight on space, consider your alternatives (see Tips). Drying (or dehydration). This is a useful method for storing fruits and some vegetables. It can be done without high-tech gadgets in most fairly dry, warm climates. Canning. This requires containers (which are reusable with the exception of lids, which may deteriorate over time) but does require proper preparation, cooking equipment, and skill. Pickling is considered in this article as a "canning" process, although it does not have to be so. Freezing. This, again, requires some cooking preparation, as well as a freezer and proper containers. Bedding. Not previously mentioned, this is a method for storing root crops such as potatoes, rutabagas, beets, and other root crops. It is accomplished by layering the product in a dry, cool, location in a straw bed. Determine the benefits of this activity compared to the cost. You will be investing a considerable amount of money in start-up costs if you do not have any materials and equipment available at the beginning. You will also have a lot of labor invested, which may translate into additional expense if you forgo a regular job to pursue this effort. Before investing a great deal of time and money, research your local growing conditions, available crop selections, and your ability to manage this labor-intensive effort. The benefits will include having food that you can enjoy without the worry of herbicides, pesticides, and other contaminants, except those used at your discretion. Begin your project in stages. If you have abundant land and sufficient equipment, you can start on a fairly large scale, but unless you have sufficient knowledge and experience, you will be gambling that the plants you select are suitable for your soil and climate. Talking to people in your area will often provide you with the best source of specific information on selecting your crops and planting times, but if this is not an option, plant "trial" plantings of new crops the first year to see how well they produce. Begin on a smaller scale, perhaps trying to grow a set percentage of your food requirements to give you an idea of the total yield you can expect, and work your way up to a self-sufficient level. Break the ground. For cultivated land, this is simply the process of loosening the soil, and "turning under", or covering, the plants or plant residue from a previous crop. It may also be referred to as "tilling", and is done with a plow or tiller pulled by a draft animal or tractor, or on a small scale, with a self-propelled machine called a "rototiller". You should clear away any large stones, roots and limbs, heavy accumulation of vegetation, and other debris before tilling. Lay of rows. With modern farm equipment, this process depends on the type of crop being planted, and "no till" planting actually skips this and the previous step. Here, we are considering the general method that would be used by someone who does not have this type of equipment and expertise. Mark out the area you intend to plant, and with a hoe or plow, create a slightly raised bed in the loose soil in a line across the length of the plot. Next, make your furrow (a shallow groove cut in the soil) with your chosen implement. Place your seeds in the furrow at the depth required for the particular crop you are planting. This may vary according to your choice of plants. As a rule, succulent plants like legumes (beans and peas)and melons, squash, cucumbers are planted between 3/4 and 1 inch (2 - 2.5 cm) deep, where corn and potatoes may be planted 2 1/2 to 3 1/2 inches (6.3 - 9 cm) deep. After placing the seed in the furrow, cover them and tamp (gently pack down) the soil lightly so the seed bed (the covered furrow) does not dry out as quickly. Continue this process until you have the number of rows you planned on planting. Alternatively, you can "start" seeds indoors (such as in a greenhouse) and transplant them later. Cultivate your crops when the ground becomes packed by rainfall, or weeds become a problem. Because you are planting this crop in rows, you will be able to walk the center area between rows (the middles) to accomplish this, if you are doing this by hand. You will want to keep the soil around the roots loosened without damaging the roots themselves. Watch for insects and animals which may damage your plants. If you see leaves which have been eaten, you will have to determine what is causing the damage. Many animals find tender young plants in a garden more appetizing than native growth, so you will have to protect the plants from these, but insects are a much more prevalent problem with growing food. You may find you are able to keep insect damage to a minimum by simply removing and killing them as you find them, but for serious problems, you may have to resort to chemical or biological control. Harvest. You will have to educate yourself to some degree on when to harvest your crop. Many common garden vegetables are harvested as they become ripe, and continue to produce throughout the growing season with proper care. Grains, on the other hand, are most often harvested when they are fully ripened and dry on the plant. Harvesting is a labor intensive operation, and as you become experienced in growing, you will find that you need to reduce the production of some plants so that harvesting can be managed. Preserve. For common vegetables, you have several choices for storing them through the non-growing season. Carrots, turnips and other root vegetables can be stored well into the winter months in the refrigerator or a root cellar. Drying produce is one option for long term preservation of meats, fruits, and vegetables, and for seed type crops like legumes, this will give excellent results. For succulents and fruits, you may want to consider canning or freezing your harvest. A vacuum sealer will give better results in freezing vegetables for long-term use. Talk with neighbors about co-oping. It is easier to manage a smaller number of different crops, and you may be able to grow enough of some of your selection of food for two families, and another family would grow enough of other crops that you can exchange them. Hydroponic gardening. This is a method of growing in a liquid medium, also known as "soiless agriculture". Vertical gardening. This method is for "vining" crops which usually require a lot of space to spread out, yielding lower units per square foot. By erecting trellises, fencing, or other support structures, you may multiply your yield per square foot, as the vines will grow upward, rather than outward. Container growing. Some plants can be grown in almost anything (even an old toilet, although tacky). Growing plants in "window boxes" has been common for many years to give a pleasant effect in the otherwise sterile environment of a city apartment, but the same process can be used to grow smaller, less root dependent food crops, like peppers, squash, tomatoes, and others. Potager gardening. This allows for concentrated blocks of vegetables and rotations. Also, it can become a beautiful way to replace a front lawn. Look at outside sources of food to supplement your farming effort. Fishing, gathering wild berries and nuts, looking for edible plants growing wild in your region, even trapping and hunting may be possibilities for increasing the scope of your diet. Don't give up growing your own vegetables in the winter! Consider growing sprouts in your kitchen. If you grow a variety of sprouts, such as radish, broccoli, alfalfa and clover, you will have a variety of tastes and types of vegetables to add fresh green to your diet to supplement your frozen and canned summer vegetables. Growing your own food can be done, but you will be at the mercy of nature, in the form of pests and weather, either of which can destroy whole crops in a remarkably short time. Growing your own food requires patience, persistence and a lot of bending and lifting and carrying. Be prepared to sweat. Wear socks under clogs or easy-to-clean footwear. Protect yourself from sun and insects (ticks & mosquitoes carry life-threatening diseases) by washing thoroughly and often. Home canning must be done properly to be safe, in order to avoid botulism and other diseases. Suitable land for agricultural purposes. Storage methods, tools and space. Article provided by wikiHow, a collaborative writing project to build the world's largest, highest quality how-to manual. Please edit this article and find author credits at the original wikiHow article on How to Grow Your Own Food. All content on wikiHow can be shared under a Creative Commons license.